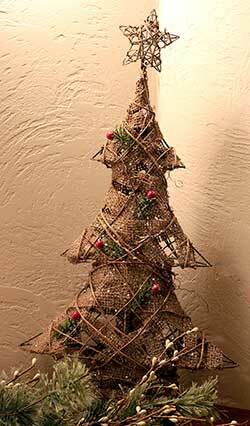 Primitive Christmas Decor, for that homey holiday look! 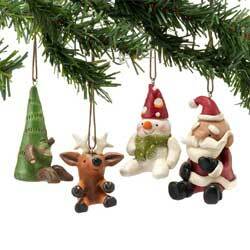 Snowmen, santas, ornaments, decorative plates, figurines, wall decor, and more! Pine Tree Wishes Towel, by Raghu. 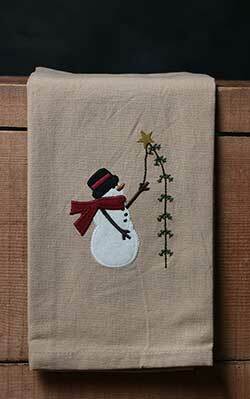 Tea dyed tan cotton dishtowel with wool and cotton applique/embroidery of a snowman putting a star atop a feather tree. Perfect for that country primitive Christmas! Measures 18 x 28 inches. Machine washable (see label for care instructions). Features stenciled artwork of a red poinsettia, perfect for Christmas or winter! Designed by artist Sandy Clough. 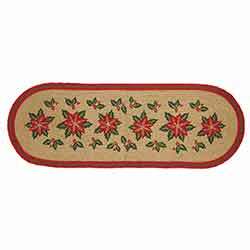 Poinsettia Hand Towel, by Park Designs. Embroidery reads: Believe in the magic of Christmas. Has appliqued holly leaves and button berries. 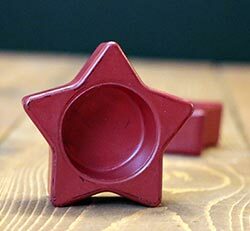 Attaches to a cupboard handle by hooking over and buttoning with the tiny star button. 100% cotton. 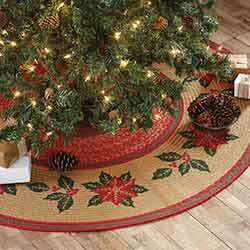 Poinsettia Jute 50 inch Tree Skirt. 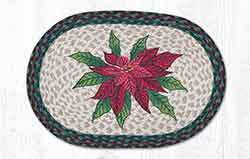 Traditional poinsettias and holly berries are stenciled in holly berry red and forest green on natural braided jute. 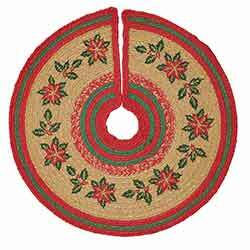 Poinsettia Jute 21 inch mini Tree Skirt. 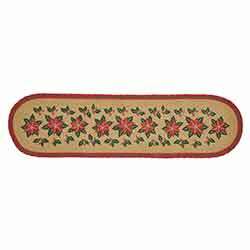 Traditional poinsettias and holly berries are stenciled in holly berry red and forest green on natural braided jute. Get the down-home Christmas look without the mess with our strung popcorn garland! This one has the addition of reddish brown chestnuts. Get the down-home Christmas look without the mess with our strung popcorn garland! Primitive Icicle Ornament, by Primitives by Kathy. 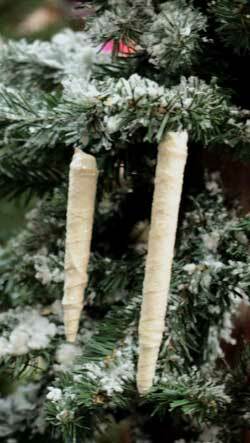 Primitive-style icicle ornament made of ivory colored wrapped batting, with a dusting of clear glitter and a wire hanger. Sold individually from the 2 sizes shown - Longer one is 5.5 inches long, and Shorter one is about 4.25 inches long. 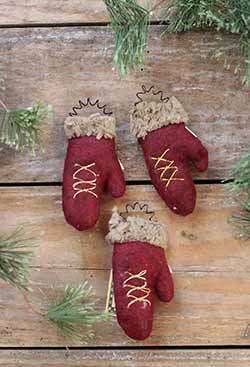 Perfect for a small tabletop tree or an evergreen garland, these red mitten ornaments lend your winter decorating a country primitive look! He wears a felt hat accented with a jingle bell and moss, a plaid scarf, and three jingle bells down its soft belly. 12 inches. He wears a felt hat accented with a jingle bell and moss, a plaid scarf, and three jingle bells down its soft belly. 7 inches tall. 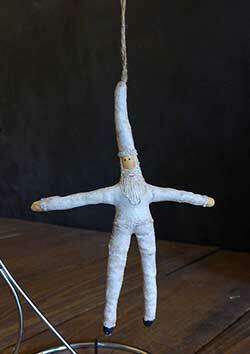 This star-shaped Santa is stitched of canvas, painted, and grunged for a prim look. This is for the GREY ornament. Measures 5 x 0.75 x 6.75 inches. 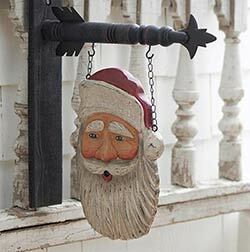 This star-shaped Santa is stitched of canvas, painted, and grunged for a prim look. This is for the IVORY ornament. Measures 5 x 0.75 x 6.75 inches. 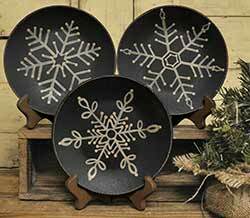 One of our favorite primitive plates for Christmas, the black and tan design of this set creates a striking accent to any country Christmas display! Hand painted on a small wooden acorn, this prim little snowman head is sure to add holiday cheer to your country Christmas! 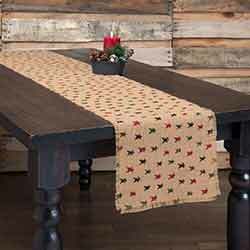 With the Primitive Star Jute 36 inch Table Runner you willhave a Prim Christmas that hearkens back to days of yore. 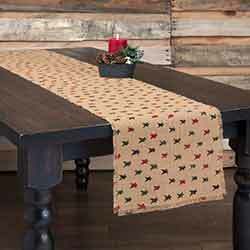 With the Primitive Star Jute 48 inch Table Runner you willhave a Prim Christmas that hearkens back to days of yore. 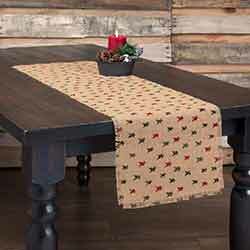 With the Primitive Star Jute 72 inch Table Runner you willhave a Prim Christmas that hearkens back to days of yore. 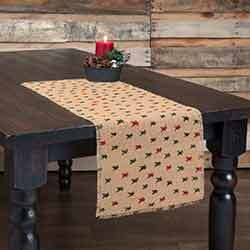 With the Primitive Star Jute 90 inch Table Runner you willhave a Prim Christmas that hearkens back to days of yore. 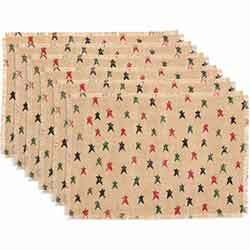 With the Primitive Star Jute Placemat Set you'll have a Prim Christmas that hearkens back to days of yore. 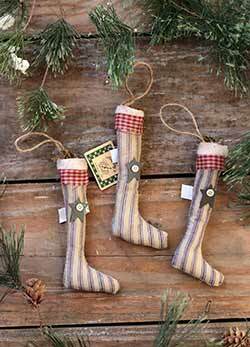 Perfect for a small tabletop tree or an evergreen garland, these stocking ornaments lend your winter decorating a country primitive look! Pumpkinseeds Mini Ornament, a Janelle Berryman design, part of her Pumkinseeds Originals line. Reproductions from Janelle's original paperclay creations, these wonderful figurines have truly unique character. You can see the quality in the whimsical forms, detailed painting and antiquing. This is for her Mini Ornament - sold individually from the 4 designs in photo - Choose the Tree, Reindeer, Snowman, or Santa. Largest measures 2.36in H x 1.89in W x 1.57in L.
Rattan Tree with Star, by Hanna's Handiworks. This tabletop accent tree is made of wrapped twig shaped into a tree with a star on top. Accented with red berries, and lightly dusted with mica glitter snow. Measures 19 inches tall, 11 inches wide, and 3 inches deep. Red Bulb Ornaments, by Primitives by Kathy. 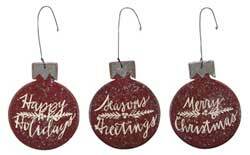 Bulb-shaped wood ornaments painted red with hand-writing-style lettering in cream, distressed for a rustic look, and lightly dusted with mica glitter. Set of THREE includes one of each shown. Measures 4 x 5 inches. Other signs and ornaments also available! Red Burlap Tree Skirt, by Primitives by Kathy. This simple tree skirt is made of a soft, cotton woven burlap material in a muted red color, adding a natural look that coordinates beautiful with almost any decorating style! 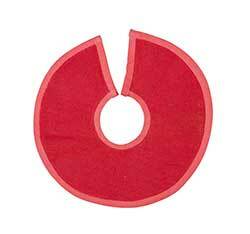 This is for the 12 inch Tree Skirt. Others also available! Red Burlap Tree Skirt, by Primitives by Kathy. This simple tree skirt is made of a soft, cotton woven burlap material in a muted red color, adding a natural look that coordinates beautiful with almost any decorating style! 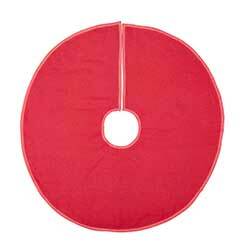 This is for the 36 inch Tree Skirt. Others also available! 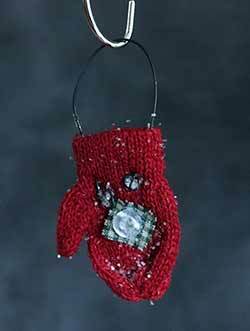 Mini red knit mitten accented with homespun fabric, button, and jingle bells, with wire hanger. This star-shaped tealight candle holders were painted a rich barn red color, and purposely distressed for a vintage look. 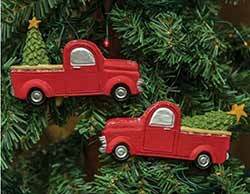 This set of two resin ornaments are in the shape of red pickup trucks hauling Christmas trees. Reindeer Feed Hanging Bag, by Primitives by Kathy. 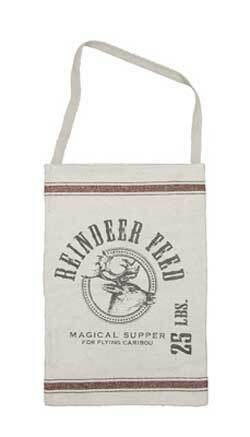 This rustic cotton bag is printed with a vintage reindeer feed ad. Measures 12 x 18 inches. We like to display lit branches in these bags, and hang over a cupboard door! Made of 100% cotton. 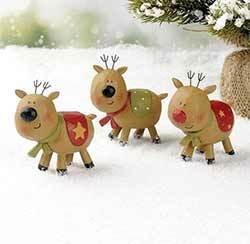 May your days be merry and bright with one of these darling little reindeer, dressed in a festive scarf and blanket! Choose the Left, Middle, or Right deer. 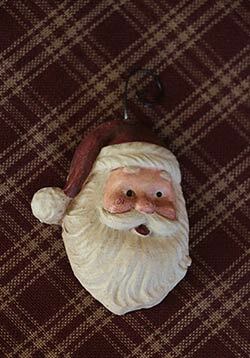 Resin Santa Ornament, by Primitives by Kathy. A Johanna Parker design. Measures approx 2.5 x 2 inches. Made of paper mache, painted, antiqued and distressed for a vintage look, with wire hanger. Flat back side perfect for personalization! 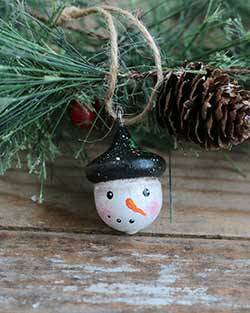 Resin Snowman Ornament, by Primitives by Kathy. A Johanna Parker design. Measures approx 1.25 x 2.25 inches. Made of paper mache, painted, antiqued and distressed for a vintage look, with wire hanger. Flat back side perfect for personalization! With their old-fashioned, rustic, handmade folk art charm, Honey & Me figures and accents add primitive charm to your country home! This is for the Saint Twiggy. Santa Face Arrow Replacement, by K & K Interiors. 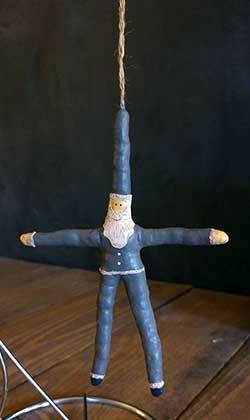 For your Christmas decor, this primitive santa will say "Ho Ho Ho" to all your holiday guests with his jolly face! 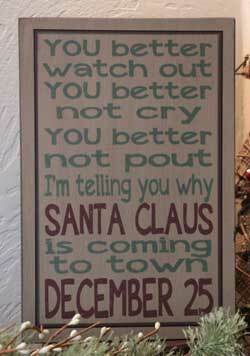 This box-style wood sign is painted with lyrics to the song "Santa Claus is Coming To Town." This is for the Tan sign. 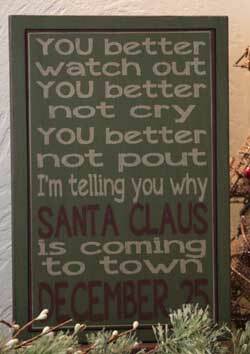 This box-style wood sign is painted with lyrics to the song "Santa Claus is Coming To Town." This is for the GREEN sign. 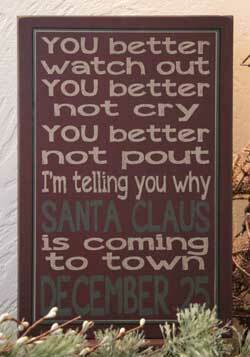 This box-style wood sign is painted with lyrics to the song "Santa Claus is Coming To Town."